Dr Sanjeev Kapadia qualified from Guy’s Hospital in 2000. Sanjeev started working at the Dental Care Centre in Muswell hill in 2002 having completed his Vocational Training position in Harlow, Essex. In 2003, Sanjeev completed the Society for the Advancement of Anesthesia in Dentistry. This enabled him to help nervous patients with a variety of sedation and therapeutics techniques. In 2005, Sanjeev decided to further his education in Clinical Dentistry by heading over the USA, to the world-renowned Pankey Institute in Key Biscayne, Florida. This allowed him to practice advanced, comprehensive and predictable Dentistry, which he has been using to treat his patients to this day. Sanjeev then completed Advanced and Master Class training in Facial Aesthetics with Professor Bob Khanna in 2006. This allowed him to help his patients to improve and regenerate the face by reducing lines and wrinkles using botulinum toxin and dermal filler injections. He has also treated many patients using injections to help patients to reduce teeth grinding. Sanjeev also completed certification in Invisalign (invisible braces) and Enlighten Tooth whitening to help his patients maintain beautiful smiles. In 2007, Sanjeev embarked on his Implant training. He trained with one of the worlds leading Implant Surgeons, Professor Hilt Tatum and in doing so, completed an extensive training programme at The Tatum Institute in Surgical Implantology. He also completed a one-year Implant Dentistry Program and gained a Certificate from GIFT (General Implant Forum & Training). Since then he has placed several hundred implants and completed numerous Bone Grafting procedures to help his patients achieve the best possible long-term results. Sanjeev has also been able to provide his patients with a set of permanent teeth supported by implants in 24 hours. Sanjeev regularly attends International meetings and conferences in both Implantology and Facial Aesthetics, which keep him at the forefront of the fields. He became the Principal of the Dental Care Centre in 2006 and has continued to grow and develop the practice. He has now limited his practice to Implant Dentistry and Facial Aesthetics. 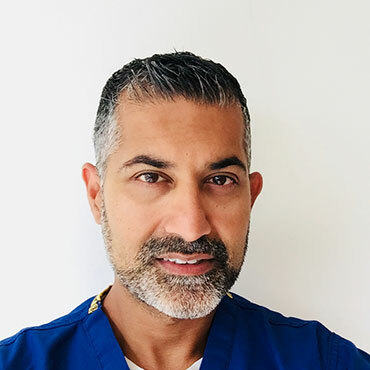 Sanjeev has also taken up positions as a ‘Visiting Implantologist’ at three other dental practices in London & Hertfordshire to help provide high-standard Implant Dentistry for their patients. He is also a Member of the Association of Dental Implantology UK. In his spare time, Sanjeev enjoys travelling, cooking, health and fitness and practicing yoga with meditation. When he is not working he is committed to spending quality time with his wife Nisha and two sons Kush and Dhruv.